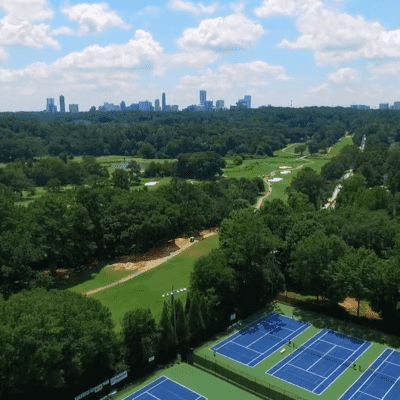 Home of the largest city park in Atlanta, the Chastain Park neighborhood is known for its beautiful homes, jogging paths, amphitheater, and equestrian center. Chastain Park is also home to a branch of the PATH, which is a network of off-road trails around Atlanta for walkers, cyclists, and runners that started in 1991. Located in the city of Buckhead, the Chastain Park neighborhood was originally acquired by DeKalb County for the purpose of holding town hall meetings in the 1840s. In 1900, Fulton County purchased the land and built an almshouse for the poor on the property. It wasn’t until 1940 that residential use for the area was suggested. When Fulton County made their plans for the new residences, they set aside 268 acres for the park. The State Bank Amphitheatre at Chastain Park is a popular outdoor music venue within the park itself. Since its opening in 1944, the Amphitheatre has been host to all kinds of musical acts from Frank Sintra to Mary J. Blige. Only operating between April and October, the venue seats roughly 6,900 people between the lower level, stands, and general admission lawn.